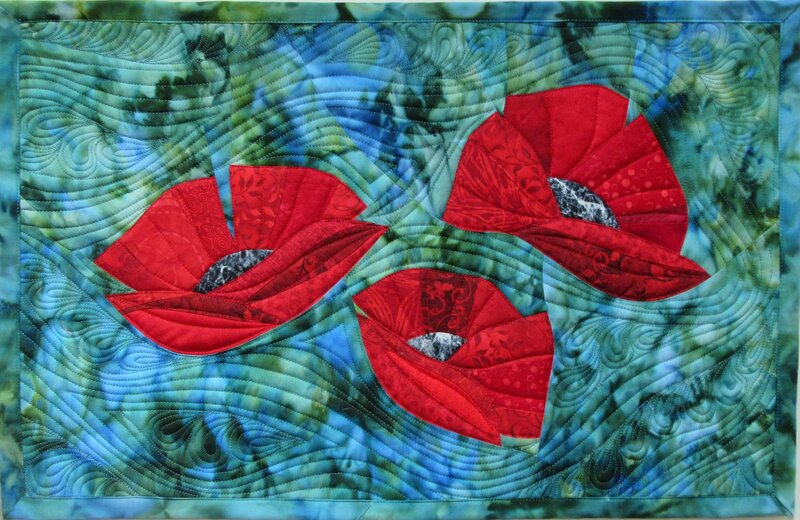 Last week I posted four poppy quilts I had finished piecing but not yet quilted. Here are the photos of the finished quilts. If you click on the photos you should be able to see them large enough to see the free motion stitching. Three Red Poppies on beige/grey background: I quilted the petals so as to accentuate the lines of the petals. I did some curvy stitching on or near to the three stems. Lastly I sewed a stipling design on the entire background. 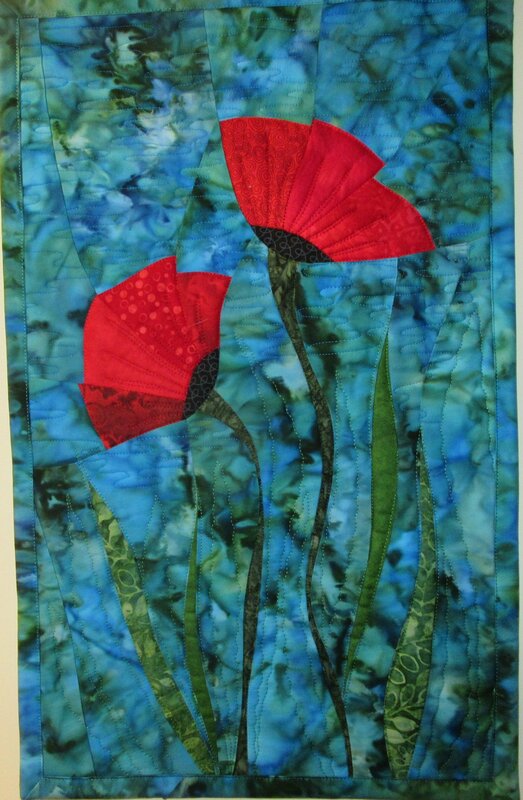 It is always hard for me to figure out how to quilt stitch the background of these poppy quilts. I don’t like to do stipling all over as I feel everyone uses that design and want to do things differently. However, with this Stonehenge fabric, the stipling does it’s job as quilt stitching without taking anything away from the awesome colors of the fabric. 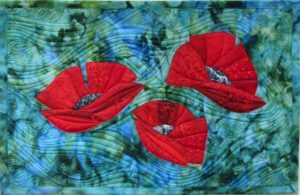 Two Red Poppies on blue background: These fairly simply pieced flower petals needed something special for quilt stitching so I did curvy, narrow points to sort of look like the parts of the flower inside. To highlight the green leaves pieced into the lower part of the quilt, I sewed more leaf designs around the two flowers and between the pieced leaves. For the background from the flowers to the top of the quilt I did something I’d never done before (This is when you wonder if you are going to ruin the entire quilt or do something you like!!!). I did a free motion meandering sky or cloud like design that serves to draw your eyes horizontally from the flowers up while the stitching on the lower half draws your eyes vertically. I love the contrast! 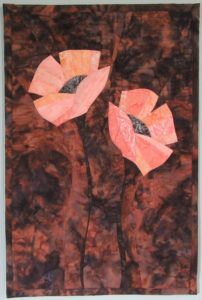 Two Peach Poppies on brown background: I had to think about how to quilt this one for a few days. The fabric colors were so dramatic that I wanted to be sure my stitching would enhance and not detract from the background. 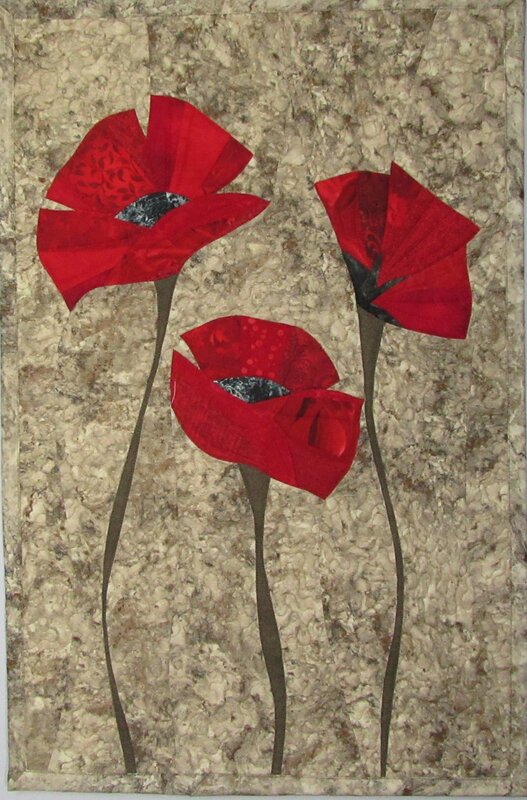 First I quilted the flowers and the stems the same as the “Three Red Poppies on beige/grey”. Then I stitched five bottom up leaves almost to the flowers in a free motion design mimicking leaves. Next I did the same cloud like horizontal curvy stitching from just below the flowers up through the upper part of the quilt above the flowers (same as the “two red poppies on blue”). Finally, I did a tight stiple pattern in the open area between the stitched leaves, the stems and the flowers. There is a lot going on but I like the variation and the way the background fabric still has top billing as the accent for these peach flowers. 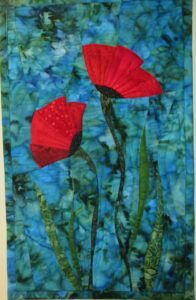 This was a fun two weeks focusing on poppies and trying some different piecing and different free motion stitching designs.